And instantly I thought of Heinlein’s 1951 novel The Puppet Masters, with aliens clinging to human spinal cords. 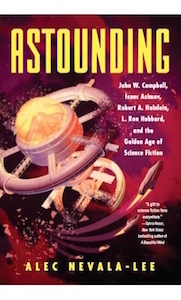 With his life-long interest in past lives (he even claimed to have remembered his own past lives, when he was a child), Heinlein might have been a powerful and useful convert to Dianetics and Scientology. Campbell certainly tried. How SF would have been different had Hubbard and Campbell succeeded! Perhaps SF owes Ginny and their time in Colorado Springs more than we realized. Italics mine, obviously. There’s a very interesting alternate history to be written here. Maybe I’ll write it one day! Hubbard is one of those figures that I would like the world to forget except then lessons might not get learned. Having said that, his reputation precedes him and I’ve not read a word he wrote. Longreads article is a very handy overview. The book is looking interesting. By which i mean yours, not his. @Darren: For better or worse, there’s a lot to be learned from Hubbard.